Yeah, its been ages. We've done a fair few things and all the photos are sitting in the cloud waiting for me to process and do something with them. We've been to Las Vegas and back, stayed with our friends in LA, checked out the Star Alliance lounge in LAX, saw a Blue Man Group performance, trekked to the M*A*S*H filming site, watched a Guinness World Record holder bubble blowing performance, frolicked at the mouth of the harbour in Whatipu, bumped into Christoper Luxon at the AirNZ engineering day, taken Kien to his first ever team sport practice...but the words ain't coming easily enough let alone the inclination to sit down for an hour (or three) and recall and write and edit. So the posts will come in drips and drabs, and completely out of chronological order, but hey, doesn't matter so long as it happens. 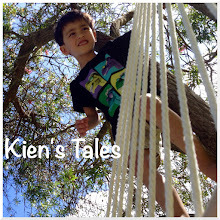 This here blog has been the only consistent record of what we do/what Kien's life consists of. The only reason I remember most of Kien's firsts is because we took pictures and I wrote about it here. Otherwise it would have just been some random photos stuck on the hard drive somewhere. We like volcanoes, and luckily Auckland has plenty to choose from when we want to have a quick walk. On Saturday we chose Mt Wellington since it was close to where we were and where we were going. We walked the perimeter, and then we went down to the crater. There's still plenty of scoria down there - amazing that after 10,000 years! Michelle and the kids were in Auckland this weekend, so we went over to see them. Michelle and I walked the kids to the beach/park, played on the playground, collected feijoas and hibiscus, and the only photo I took was them sitting on the berm across the road from Rod and Gun's place. Well he did. I just walked...and ran after him when he sped away so quickly and didn't wait for me. I'll remember next time to put on my running gear. The kid can ride. Fast! We parked just after the bridge between Judges Bay and Okahu Bay, and went all the way to Mission Bay and stopped for him to have an ice-cream before turning around. He now belongs to the Western Springs Association Football Club (WSAFC). First team sport for him, and its been...interesting? (I've got so many thoughts that I can't even process right now about his performance). I love their uniform. The kids all look so cute out there. Right, I need to get off my behind and go out and get some much needed vitamin D.